Easter means many things to many people. It is a day of reverence and serenity, fellowship and a celebration of life. Spring, merely a few days old, has sprung once more, even if the great outdoors still looks more like it's gearing up for Christmas, depending on whereabouts in the world you live. It is sweet and gentle, tranquil, earnest and beautiful. With each passing year, I find myself more and more eager to celebrate Easter and spring, however short-lived the latter may be here in Canada. Sure, right now, we're teetering between rain and snow still, but there are signs and feelings that any day now spring will truly arrive. The birds begin their chorus earlier in the morning, trees that once seemed devoid of life have perked back up, their branches ready to shot out new buds at a moment's notice. The wind, though nippy, isn't quite as harsh, it's mellowed just a touch and knows that in a matter of weeks, it will be blowing about the hems of sundresses once more. This weekend we gather with family and friends to embrace whatever Easter means to each of us. For me it is all of the things above, as well as a time to reflect on the blessings that have come our way throughout the first three months of this year. To focus on the good, the positive, the optimistic, and the joyful. We're a quarter of the way through 2013, and already so many wonderful things have transpired, just as I like to believe more will continue to as the rest of the year unfolds, much like the petals on the first blossoms of spring. From the bottom of my heart, I wish each of you a blessed, wonderful Easter that's every bit as sweet as the chocolate eggs hiding in nooks and crannies around our homes, and hope dearly that the beauty of this day carries on throughout the spring for all of us. Ok, technically eight, going on nine days, but I couldn't help taking the inspiration for this brief post's title from the similarly named 2011 film about Marilyn Monroe. As I sit here in the early hours of the morning typing this (while perched on a stack of pillows in our en suite bathroom - a quiet little respite from the boundlessly curious and playful new pet in our midst), I am completely dog tired. This is only fitting given that reason for most of my exhaustion (above and beyond the usual severe fatigue I battle due to my chronic health problems) is our darling Miss Annie. It's been a long time - perhaps more than a year - since the last time six days passed between posts here. Such was the case however, between this and my previous blog entry, in which I introduced you all to cuter-than-a-million buttons Annie. She is a joy and handful, a constant learning experience and a blessing beyond measure, and I am honestly still a touch in awe of the fact that we really do have a dog of our own at long last. Much as we'd hoped (and planned, in a general sense) to get a dog for years, the actual act of bringing Annie into our lives happened on the spur of the moment, with no time to prepare. Though I'd always imagined getting a dog would prove challenging for me (from a health stand point), even I was caught off guard a bit by just how much these rambunctious, busy, activity filled days of early puppyhood would knock out of me. Days - not "a day" - but multiple days are passing between when it seems I have even a brief moment to make it onto the computer, which is in rather stark contrast with the fact that, since early 2012, it's been rare for more than 48 hours to pass without me powering up the ol' laptop at least once. Lest it seems like I'm bemoaning these past few days, let me assure you that I'm not. Though I do regret that I've missed keeping abreast with all of your blogs and the others I follow via my feedreader (as well as connecting with you through social media sites), I wouldn’t trade this wondrous time with Annie for all the doughnuts in Canada! I know that for the next few weeks in particular, as Annie continues to grow (and especially prior to her next round of shots after which she can safely start going outside and coming in contact with other dogs, which means we - lacking a yard of our own - can safely begin exercising and potty training her outdoors), my usual computer time will likely be slashed. That said, this morning, after close to nine days of almost no time spent online, I'm hitting the proverbial reset button, marking all unread feeds read, and (temporarily) streamlining my usual online activities in the hopes that I'll be better able to keep up with blog post writing here, feed reading/blog visiting, and to a much lesser extent, social media. I suspect some days will be easier than others on that front, but I'll give it my best shot for sure - adorable puppy very much in tow every step of the way. And speaking of Annie, I truly want to thank each and every one of you who commented on my introduction post about her last week, as well as to all those who sent congrats and happy (and insightful) words my way via Facebook, Twitter, Instagram, and email. As the week barrels on, you'll be seeing other posts from me here (some of which were written earlier this month, prior to Annie's arrival) and I'll aim to visit each of you on a more regular basis again. I know I've not been out of the loop for very long, but I derive such joy from visiting and commenting on your blogs, that I miss it dearly when such is not possible even for a short amount of time. As the night's gorgeous full moon is knocked from the horizon by a pale late March sunrise, and I try to blink away my exhaustion (I haven't slept yet tonight) just long enough to type these last few words, I can hear Annie going at it with one of her plush dog toys downstairs. This past Monday, our lives changed in an incredibly precious and wonderful way. Two days shy of the ninth anniversary of the day that we meet (March 20th), Tony and I welcomed a puppy into our family for the very first time. We are both massive dog lovers and have dreamed of getting a puppy throughout our whole relationship. This week, in celebration of nine years together, we did just that. Hailing from Delta (a part of the Metro Vancouver area down on the Lower Mainland), our darling new girl is named Annie - her name celebrating the fact that she's our anniversary gift to one another this year. I cannot begin to put into words that joy that we're both feeling right now. It's incredible to have to new, darling bundle of puppy joy in the house (we found the listing for, and bought, her on the same day - Monday - so hence why I didn't post about this exciting chapter in our lives prior to the fact). Our sweet girl (seen above in an iPhone photo I took yesterday afternoon) is an almost nine week old American Bullador (a cross between an American Bulldog and a Labrador Retriever). More than just a "gift" in the sense of something that one gives or receives, Annie is a beautiful blessing who will no doubt enrich our lives in countless ways. I love her to pieces and then some! It's hard not to have a few tears of happiness tumble out of my eyes each time I look at her for more than the quickest of moments. Sweet, very well tempered, curious, playful, alert, intelligent, and healthy, she is so tremendously amazing that I still feel like I have to pinch myself to believe that she's real. She is though, and as new puppies take a lot of time and energy, I've not been online since Monday (save for a few minutes yesterday - chiefly to write this post) and suspect that my presence will be pretty scare for the next little while. I want to take a moment to thank you all very much for your blog comments this week - including on Monday's Ice Phone giveaway (which I just want to note, is not only for iPhone users - the Ice Phone is compatible with nearly all modern cell phones). As many of you know, I always try my best to visit and comment on the blogs of those who super sweetly do the same for me, but I may be a touch behind on that front for the next little while these highly formative early puppyhood days are underway. Likewise blog posts here may appear a tiny bit less often just (I'd imagine) for the next few days. It's fantastic to be able to share about Annie with all of you this morning - I've been so eager to do so since the moment we decided we were going to get her - and likewise to know that she'll be a part of this blog - as the newest Cangiano family member - from her on out (be sure to follow me on Instagram for the latest snaps of this super cute little girl). Sending happy start of spring wishes - and countless new puppy kisses (and, goodness, is she a kisser!) to each and every one of you! Cue the chorus of songbirds chirping merrily, the woodland critters prancing through newly sprouted fields of green, and the heavenly rays of sunshine slicing through the clouds. Ok, so this might be a slightly Disney-esque version of what this morning should look like, but it doesn't mean we can't envision it appearing this way all the same. Today marks the first day of spring 2013, and with it a season of renewed life, scrumptious fresh garden eats, and of course the return of warm weather dressing, a point which, quite frankly, I'm ecstatic about. I've enjoyed my tweeds and tights, bulky sweaters and snow boots, but it's high time we parted ways and my trusty sundresses came back into heavy rotation. A breezy wardrobe isn't the only thing spring has on the horizon for us. No, this is always a busy season, filled with energy and loveliness, and an inborn desire to be productive, as we shake the proverbial cobwebs of winter out of our soul. So, just want are some of the things that spring has in store for us this year? And in a few days time, we'll gather to celebrate Easter with all manner of eggs, chocolate goodies, and if we're really lucky, a new festive bonnet. 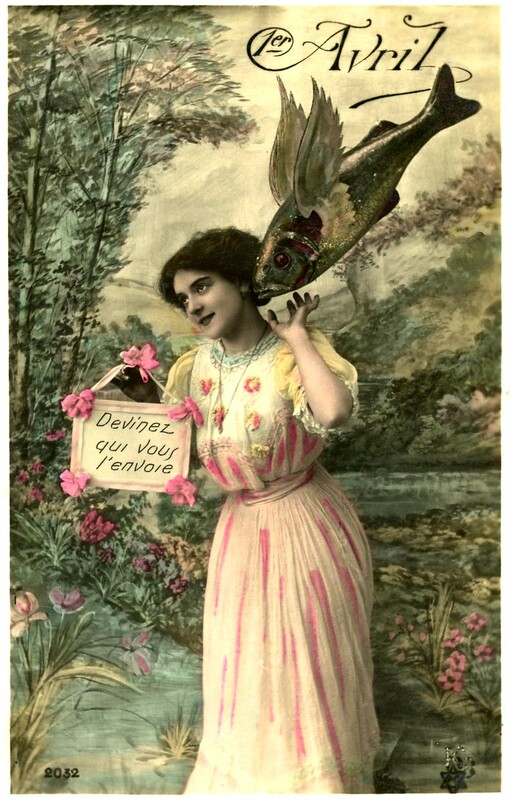 Falling on Easter Monday this year, we run into April Fool's Day next (I'm not one for pranks myself, but I do enjoy looking at vintage French April Fool's Day postcards like the lovely one below). April usually means the end of snow and the start of warm weather dressing. Sporting a bathing suit in the great outdoors is still always off, but that's completely ok, it gives up plenty of time to done of favourite vintage springtime fashions, such as this immensely elegant floral adorned look from 1945. One thing that comes part and parcel with spring for most is taxes. Whether you dread them or eagerly await the potential refund they might yield, there's no skirting around the fact that they're a necessarily part of this time of the year (note that the following image is from a 1944 Life series of people dealing with their taxes at an Internal Revenue office in New York City). We all know the old expression about April showers, and goodness is it true sometimes! To help make those rain soaked days more bearable (and protect your shoes), why not slip into a pair of vintage rain boots or overshoes like these charming Rain Dears from 1952? May 1st means it's time for May Day once more. I don't have a pole to prance around, but that doesn't mean I don't feel giddy when the fifth month of the year begins. If you haven't done so already, now is the perfect time to set aside a day or two (or however long you need) to give you home a thorough once over as part of the annual tradition that is spring cleaning. Without a doubt one of the loveliest - and most highly anticipated - elements of springtime is the seemingly endless array of blossoms and blooms that, as if by magic, pop back into existence once more. Of course, now that the warm weather is here again, one will also want to sport a bevy of flowers in their outfits, too (especially for days with delightfully fun outings such as an afternoon as the fair). Though we didn't endure an overly harsh or long winter (I've certainly known far more brutal), there was something about this past season that seemed to drag on and on and...you get the picture. I think that it largely has to do with the fact that we own a car now (something that we couldn't claim prior to March 2012) and as such, when spring starts, we're able to take off and explore the world, bathed as it is in pale, gorgeous sunlight, once more (in a way that, let's face it, you just can't without a set of wheels). Having a car also makes getting to a large number of yard sales all across town a whole lot easier, and as I love yard sales with an ending passion, knowing that their season was going to commence again soon, really made the last few weeks of winter feel like they were a decade long a piece. I'm wholeheartedly happy that spring is here. It won't all be cute Easter bunnies, blooming lilacs, and rainbows after a thunderstorm of course, but I sense that it's going to be a terrific season, and I can't honestly recall the last time I was looking quite as forward to spring as I am this year. Here's to the hope that this season sparkles with merriment, fun and tons of wonderful vintage yard sale finds for all of us!